During pregnancy, your nutritional status plays a key role in your own health and that of the baby you’re carrying. For example, folate is involved in several aspects of conception and pregnancy including red blood cell production, foetal growth and the healthy development of your baby’s organs. 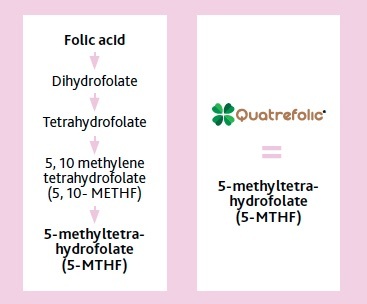 In order to be utilised by the body, folic acid from supplement and folate from food need to be converted into 5-methyltetrahydrofolate (5-MTHF). Oriental Botanicals Conception & Pregnancy Care provides 500mcg per day of activated forms of folic acid (250mcg folinic acid and 250mcg 5-MTHF as Quatrefolic®). These forms of folic acid don’t require as much metabolic processing as regular folic acid before they can be utilised by the body. Women with certain genetic profiles (including up to half of those of Caucasian and Asian backgrounds1) may have difficulty metabolising regular forms of folic acid. Due to their activated status, folinic acid and 5-MTHF are considered more suitable forms of folic acid for people affected by these genetic issues. Oriental Botanicals Conception & Pregnancy Care also contains activated vitamin B2 (riboflavin sodium phosphate), vitamin B6 (pyridoxal 5-phosphate) and vitamin B12 (mecobalamin). Vitamin B12 helps prevent neural tube defects in women whose dietary intake is inadequate, including those who are vegetarian and vegan. Other nutrients that may be beneficial for women in the lead up to pregnancy include zinc, which maintains healthy hormone balance during the menstrual cycle. Along with other antioxidants such as selenium and vitamins C and E, zinc also supports preconception health by helping reduce free radical formation in the body. Many women in Australia have low dietary intakes of iodine, so the National Health and Medical Research Council (NHMRC) recommends supplementation with 150mcg iodine per day for women who are pregnant, planning pregnancy, or breastfeeding2. Adequate intake of iodine is required in the diets of mothers-to-be for normal foetal development, and in particular for healthy development of your baby’s brain, nervous system and cognition. Similarly, many women in Australia who are in their childbearing years have inadequate levels of vitamin D3. Babies born to mothers with insufficient vitamin D are also likely to be low in this important nutrient, which is required for healthy foetal development and building healthy bones. Oriental Botanicals Conception & Pregnancy Care also contains nutrients to support healthy red blood cell formation, immune function and stress responses in the body. Additionally, this comprehensive multivitamin and mineral supplement provides a broad spectrum of nutrients to support the increased nutritional requirements of women who are breastfeeding. During breastfeeding, Oriental Botanicals Conception & Pregnancy Care is suitable to use alongside Oriental Botanicals Breastfeeding Care, which contains herbs used to enhance breast milk production in traditional Western herbal medicine. NO artificial colours, flavours, sweeteners or preservatives, gluten, wheat, nuts, dairy or animal products. Vitamin and mineral supplements should not replace a balanced diet. Advise your doctor of any medicine you take during pregnancy, particularly in your first trimester. Consult a healthcare professional if symptoms persist, or if you’re concerned about your health or your baby’s health. Do not exceed the stated dose except on medical advice. If you have had a baby with a neural tube defect/spina bifida, seek specific medical advice. WARNING: This product contains selenium which is toxic in high doses; adults shouldn't take more than 150mcg a day from dietary supplements.